Joaquin became a major hurricane as it tears toward the Bahamas and government forecasters said they can’t rule out a strike on the U.S. East Coast as early as Sunday. The 10th storm of the Atlantic season had top wind speeds of 120 miles (193 kilometers) an hour as of 5 a.m. New York time, up from 115 mph earlier. It was about 65 miles southeast of San Salvador, Bahamas, the National Hurricane Center said in an advisory. Computer models diverge on the storm’s track, with one from the European Centre for Medium-Range Weather Forecasts taking Joaquin away from the U.S. mainland and into the Atlantic. Others predict it will hit the Eastern Seaboard, possibly near Washington. On Sept. 30 at 2:11 a.m. EDT the AIRS instrument aboard NASA’s Aqua satellite provided this infrared look at Hurricane Joaquin’s strongest storms with coldest cloud tops circling the center (in purple). Even if Joaquin doesn’t reach the U.S. coast, the system will create strong onshore winds and minor to moderate flooding along the coasts of the mid-Atlantic and northeastern states throughout the weekend, NHC said on its website. 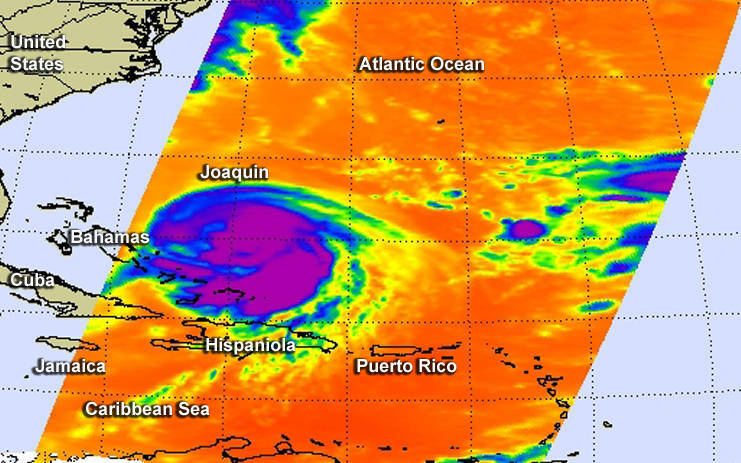 Joaquin’s hurricane-strength winds are forecast to reach the Bahamas early Thursday. It’s a Category 3 system on the five-step Saffir-Simpson scale, a major hurricane with sustained wind speeds of at least 111 mph. Additional strengthening is forecast during the next day with top winds of 140 mph, according to the NHC. Hurricane and tropical storm warnings and watches have been posted across the Bahamas including the islands of Cat, Abacos, Eleuthera and Grand Bahama Island, the Miami-based hurricane center said in the advisory. As much as 10 to 15 inches (25 to 38 centimeters) of rain may fall across the central Bahamas, and in isolated cases up to 20 inches that could potentially cause life-threatening flash floods. A storm surge may raise seas as much as 8 feet (2.4 meters) above normal tide levels, with life-threatening swells and rip currents being forecast across the chain, as well as in the southeastern U.S., according to the advisory. The U.S. hasn’t been hit by a major hurricane since 2005. Sandy was only a Category 1-level system just prior to hitting the New Jersey coast in 2012. From Maine to North Carolina, about $15.7 trillion of insured coastal property is exposed to any potential storms that come up the East Coast, according to the Insurance Information Institute of New York. Things could easily go from bad to worse. “Joaquin is the wild card,” Terry said. 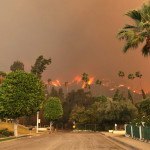 The European Centre for Medium-Range Weather Forecasts’ computer model has been predicting the storm will move away from the U.S. Other models predict it will strike along the East Coast, said Phil Klotzbach, author of Colorado State University’s seasonal hurricane forecast along with Bill Gray. “Since the ECMWF is generally considered to be the best track model, it’s a really tough call,” Klotzbach said.